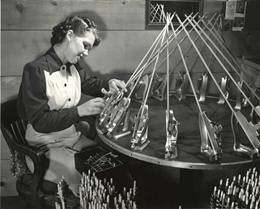 In 1946 at Allegan, Michigan, the National Field Archery Association held its first National Tournament, At the end of the first day, a young lady called "Babe" was 5 points out of second place. 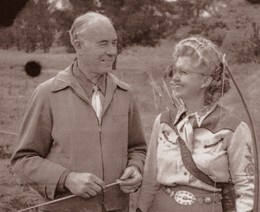 This house­wife from California competed with grim determination in the First National Field Archery Tournament. Although her doctor had advised her not to compete because of an ulcer, fortified with baby food she was determined and at the end of the' second day of competition, the California archer-ess was only 11 points behind the leader. 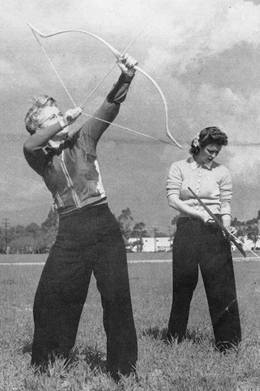 Few people realized that summer of 1946 that the little woman from California, who roared from 11 points out of first place to win the National title by 80 points was destined to become one of the greatest women archers of our time. She went on to win the Second National in 1947 leading from start to finish. She won again in 1948 and 49. Babe took up the bow after experiencing the woes of being an "archery widow" every Sunday for years. Henry Bitzenburger was no .stranger to archery^ circles and is still to this day a well-known figure in our sport. Believing in the old adage that the best way to beat'em is to join'em, Babe did exactly that. 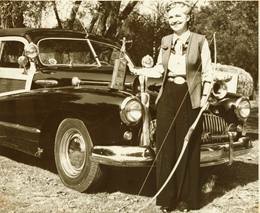 Babe was also interested in flight shooting and in 1940 she set a world record in flight with a shot of 353 yards 10 inches. In1941 she set two new world records in Flight. Her longest shot was 379 yards 2 feet' and was only three inches less than the shot by a man that year. The record of wins and championships amassed by Babe' is an enviable one! 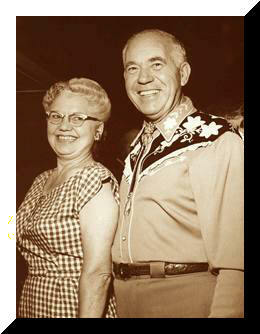 Roy Hoff once stated, "Babe Bitzenburger is to Archery what Sea Biscuit is to horse racing, hard to beat."